WhizBase is a server-side scripting language for Windows based web servers designed for rapid web development. It is 100% compatible with IIS, Apache and many others. Its syntax is smoothly embedded in your HTML code and dynamically fill your web content from various sources. Its philosophy enables very short learning curve and much faster results using whichever development environment (IDE) you want. Basic tasks, such as publishing database records on-line, can be accomplished literally in matter of minutes. The time and energy consumed doing a job with it is up to five times less than you need to do the same with PHP or .NET. OK, so what exactly is WhizBase? 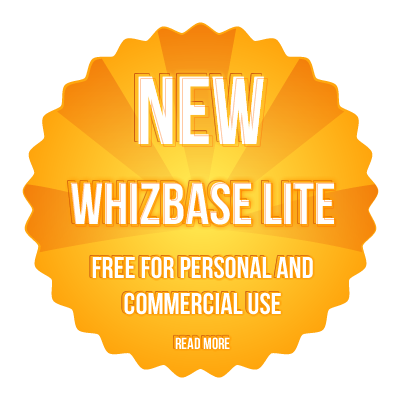 WhizBase is programming language tailor-made for easy development of dynamic web content. It can be used for building any kind of web site or web application, but it stands out with its simplicity of publishing databases on-line. I can publish database using many other tools, why should I use WhizBase? Look at this code comparison to get the idea. Both examples must perform the same tasks: connect the database, open table, read and display 10 records, create links to pages showing other records. As you can see, WhizBase uses simple syntax to do complex tasks. The results that you get by using it significantly exceed the invested resources. Actually, no! There is fully functional free version that can be used both for personal and commercial purposes. If hosted on ORG or EDU domains it works exactly as paid commercial version. If used on any other domain, free version shows small “Powered by WhizBase” logo at the bottom of the page. If I use free version I do not get any support, right? No, that is not entirely true. Of course there is (and must be) a difference between support for free users and for those that pay the license, but in general, the support that we provide for users of free version in most cases exceeds their expectations. So who are your users? Well, we have all kinds of users – professional web developers use it to get more work done with less stuff and in less time, beginners often use it because it appears to be the only tool they could find to produce something that actually works, database or system administrators use it for accomplishing small tasks without begging the programmers for help on every step, so more or less, there is something for everybody. Do my visitors have to install something on their side? No, they do not. In fact, they will not even notice that you built your web using WhizBase. WhizBase is a hypertext pre-processor, which means that it is server-side software (it is installed on web server’s side). When user requests some content from web site, WhizBase opens a script file, processes it by changing all KEY WORDS with appropriate content (something taken from database, or from other URL, or calculated, etc.) and sends processed content to visitor’s browser as a plain HTML code. You can apply for free trial space on our cloud server and test WhizBase by making your own script files or analyzing the sample code. If you prefer testing it on your own server (or desktop) computer, please write us and we’ll help you install it properly. Is there a manual of any kind? How can I learn its syntax? There is a single compiled HTML help file (.chm) and online help with detailed explanations and examples, and you can always email us to get some guidelines for a specific task.